phenominal job! that is a clean install! Flashing AFR numbers are fairly unusable, FWTW. AFR data need to be logged to be useful. What hardware you are using? Can any sensor be choosen? Which voltage scales are required? Last edited by Falk930; 01-26-2008 at 08:33 AM..
Wow Dave - way cool. I like the digital AFR - very very cool. Since you have a DTA, there's no need for logging, but what a great reference while driving. Make another - I'll buy one. What might be the approximate cost? I had not really thought of selling theses to the public. 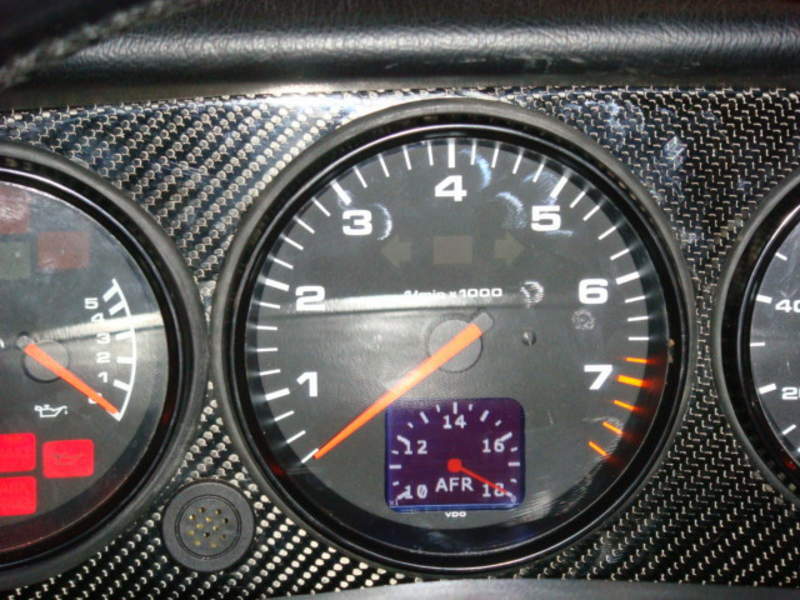 I was going to make a few for my buddies and myself who don't like the look of an A pillar Gauge ( kind of Ricer) or did not want to get rid of the clock ( lots of good warning lights ) I am going to try one in a 930 tach this week for a local guy I will take some pics if it works let me figure out how much I have in the project and I will see what I can come up with for a price ( not trying to get rich off this deal ) give me a pm if you are really interested and we can figure out something . Can a moderator please merge the two threads?? Having the AFR appear realtime in front of you is useful, but not as good as logging it. I monitor both banks individually. It is nice to see when you make a small change to your efi program and can watch it, or have someone else watch, at certain rpm ranges. A quick glance is all it takes. I want one! !If you consider making more please let me know, that is great work. 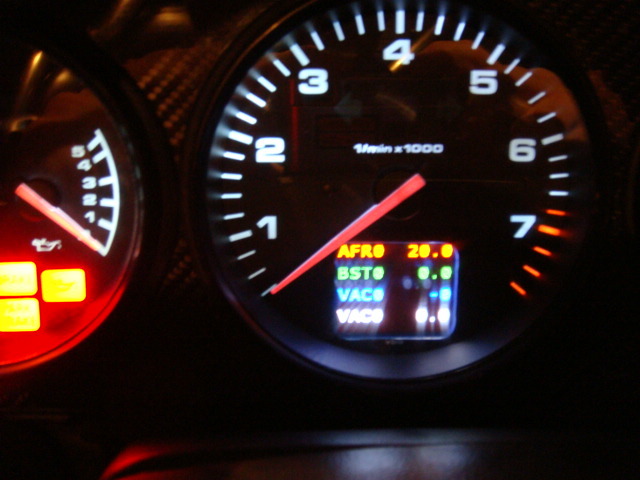 Last edited by shanghai_todd; 01-26-2008 at 08:27 PM..
Jeff, how can you successfully monitor AFR on each bank as the sensors are not supposed to be very accurate if you mount them before the turbo? Maybe you have tt? My car is NA..... why would a sensor mounted before the turbo not be accurate? 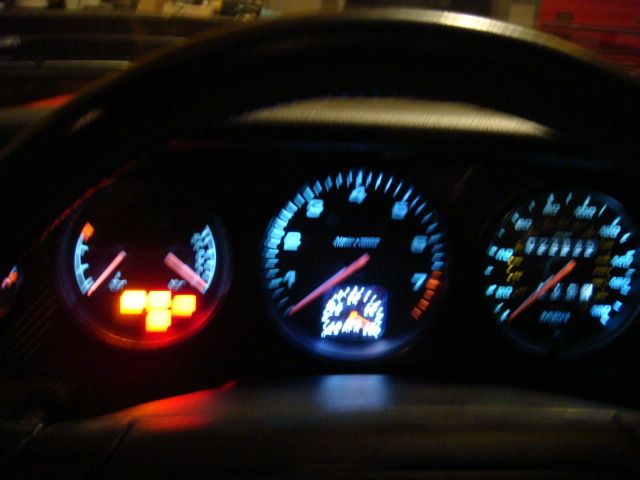 Due to back pressure created by the turbo obstructing gas flow. 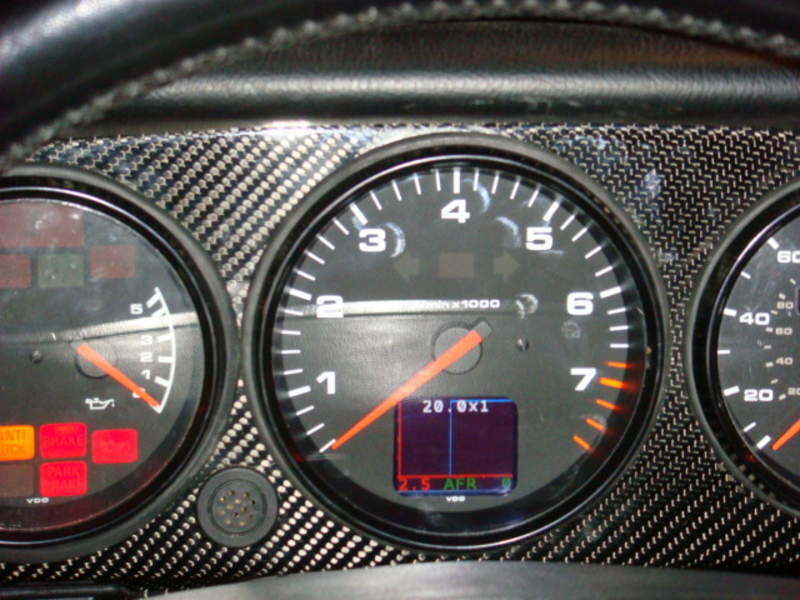 The sensors are not accurate when under pressure, they are supposed to be mounted after the turbo. I can uderstand the reason about not wanting parts of it flying into the turbo, but there is no more pressure before the turbo than one might see in an NA car. Where did you read/hear about them not being accurate when "under pressure"? There is pressure before the turbo. That is how the turbo is powered. The turbo spins from flow, not pressure. Now I agree that it creates a restriction that can cause back pressure in the exhaust between the turbo and the exhaust valve. I am just curious how much pressure are we talking about here? I thought David (125 shifter) was monitoring both banks on his efi single turbo as he seemed to know when one side was running lean. 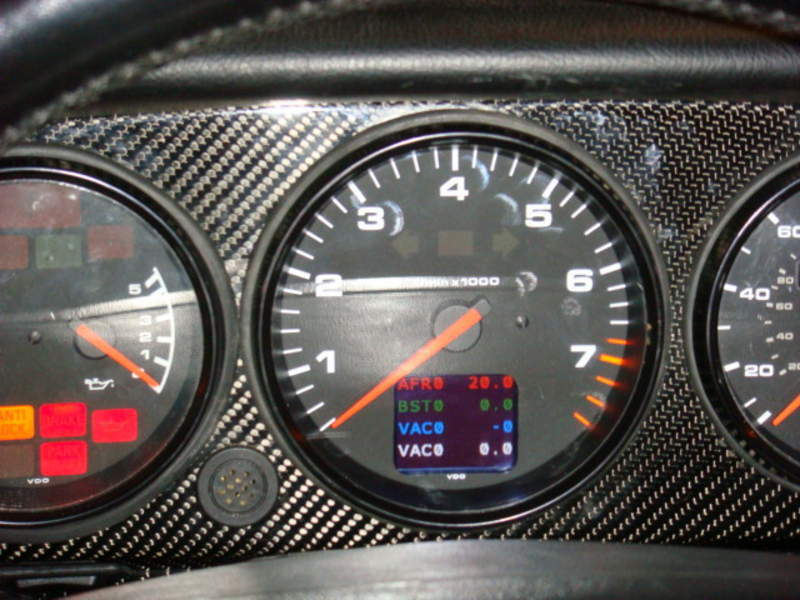 Turbo semantics aside, I had not heard that an o2 sensor would not work in a pressurized area. Not saying it is not true, but I am curious as to why and where I can read up on the theory. Jeff, there have been a number of technical discussions from Klaus on Innovate's website. 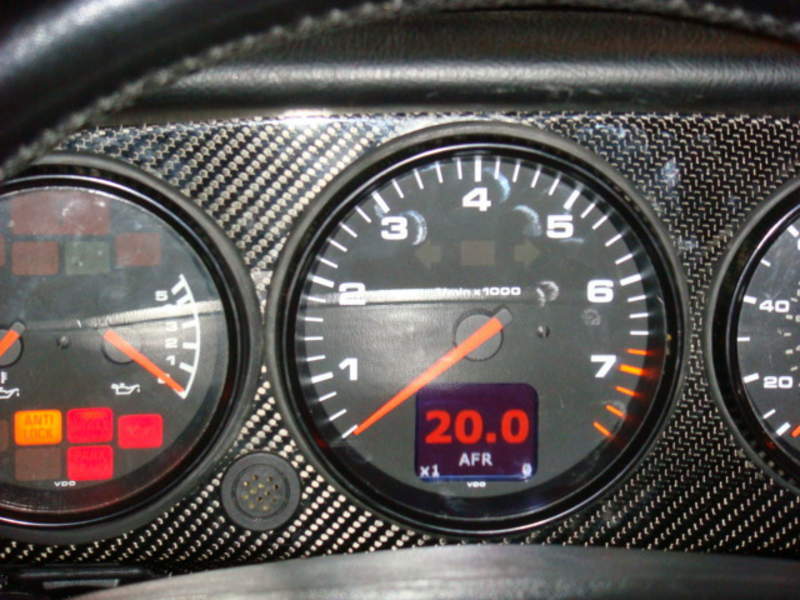 The pressure is more of an issue with WB O2's as obviously the stock O2 sensor is pre-turbo. Nice concept C2, looks like this is based on PLX devices hardware? Thanks Mike Yes it is bases off Plx I have been working with them for the last month or so to help me get something small enough to fit in the space I had to work with in the tach.